Mountains occupy a significant part of Italy. The country's north is the zone of the Alpine mountain system with a highly varied relief and amazing natural diversity. The southern slopes of the Alps with the highest point of Western Europe, Mount Mont Blanc (4810 m) form a complex system of ridges and valleys, covered with dense forests alternating and beautiful alpine meadows. The Dolomites are a mountain range in the Eastern Alps which stand among the 54 Italian sights inscribed on the UNESCO World Heritage List. These are 18 peaks rising to a height of above 3000 meters. The Dolomites are often called “pink mountains” as at sunset when the sun falls at a certain angle the rocks obtain an unusual warm pink color, casting orange reflections on the blue ice. The major territory of the Italian peninsula is dominated by the Apennine Mountains, stretching from Genoa down to Sicily. The eastern part of Sicily is occupied by the Nebrodi Mountains with the highest point in the active stratovolcano Etna. Apart from Etna, Italy has 2 more volcanoes - the famous Vesuvius, located not far from Naples, and Stromboli in the Aeolian Islands. The largest and most beautiful Italian lakes are set in the northern part of the country, not far from Verona and Milan. Lake Garda, connecting Lombardy, Trentino, and Veneto, occupies the territory of 370 km². The Alps protect the lake from severe winds which makes the climate there warm and mild. Lake Como is one of the Alpine lakes, a 40-minute drive from Milan's international airport. The lake is a famous resort area, with lovely towns and luxurious villas, pompous gardens and parks with cypresses, olive and pomegranate trees, scattered along the shore. Maggiore is the second largest lake in Italy, stretched along the territory of Italian regions of Lombardy and Piedmont and Ticino in Switzerland. Once being a beloved place among such romantic poets as Shelley and Byron, contemporary Lake Maggiore has gained a reputation of the place for the rich and famous. Other picturesque locations of Northern Italy include lakes Iseo, Orta, and Lugano. In case you travel the territory around the capital of Italy, you may visit other Italian gems - volcanic lakes. These are the lakes that formed in the calderas of extinct volcanoes. The biggest lake of volcanic origin, Bolsena, is located between Rome and Tuscany and is perfect for fishing. Mount Cavo separates two more volcanic lakes - Nemi and Albano. Te peaceful shores of Albano are the place where the residence of the Pope, Castel Gandolfo, is located. If you’ve been dreaming to explore something more mysterious, Italy boasts an impressive number of breathtaking caves and grottos. Probably the most famous Italian caves, Grotte di Frasassi are located in the natural park Gola della Rossa e di Frasassi. This stunning underworld mesmerizes by filigree columns, unusual stalactites and stalagmites, created by mother nature. The sun-kissed Amalfi Coast hides another Italian natural gem - Emerald Grotto. This sea cave is known and loved by travelers due to its mysterious green light which creates a truly fairytale atmosphere. Apart from all that, you may discover such fantastic caves as Grotte di Toirano in Savona, Grotta Gigante in Trieste, and Blue Grotto on the island of Capri. Last but not least, are the unusual rock formations - Scali dei Turchi Cliffs. 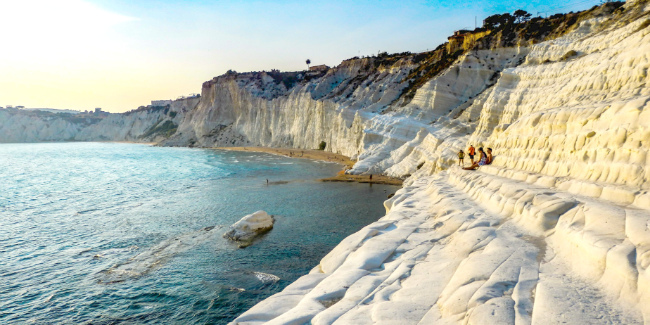 These naturally formed limestone steps are located in a picturesque corner of Sicily and are a favored spot to visit when exploring the island.